When investing becomes gambling, bad endings follow. The next credit crunch could make 2008-09 look mild by comparison. Bank of International Settlements(BIS) data show around $700 trillion in global derivatives. 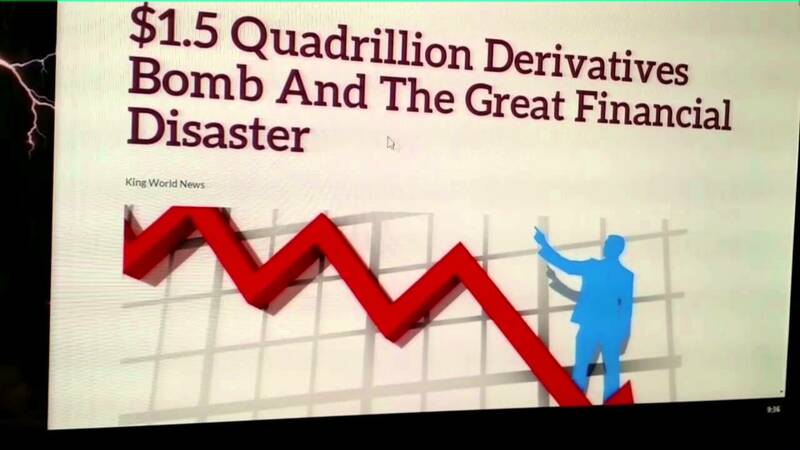 Along with credit default swaps and other exotic instruments, the total notional derivatives value is about $1.5 quadrillion – about 20% more than in 2008, beyond what anyone can conceive, let alone control if unexpected turmoil strikes. The late Bob Chapman predicted it. So does Paul Craig Roberts. It could “destroy Western civilization,” he believes. Financial deregulation turned Wall Street into a casino with no rules except unrestrained making money. Catastrophic failure awaits. It’s just a matter of time. Ellen Brown calls the “derivatives casino…a last-ditch attempt to prop up a private pyramid scheme” – slowly crumbling under its own weight. For years, Warren Buffett called derivatives “financial time bombs” – for economies and ordinary people. When corporate bosses ask financial executives how profits look in any quarter, they, in turn, ask how much do you want, then manipulate things to oblige when told. Since 2008, too-big-to-fail banks consolidated to much greater size than ever. They’re financial and political powerhouses controlling world economies to their own advantage. Civilization’s only hope is smashing them – dismantling them into small, impotent pieces, or ideally putting money back in public hands where it belongs. It’s too important to be privately controlled. Financial predators entrap small/weak nations into unrepayable debt peonage like Greece, bleed them dry, and thirdworldize developed ones into dystopian backwaters – while they grow richer and more powerful than ever ahead of the whole corrupt system going bust, decimating billions worldwide in greater human misery than already. Half-intelligent economics students know better. The Wall Street owned, controlled and operated Fed is the problem, not the solution. Monied interests buy politicians like toothpaste. They write business friendly legislation, getting Congress to pass it in return for generous campaign contributions and other special favors. America’s economy and financial system are house-of-cards disasters waiting to happen. Not according to WaPo editors. “(T)he US financial system has made significant progress toward being less bailout-prone since” the dust settled on the 2008-09 crisis, they said. The source: The Wall Street controlled Fed’s last ‘stress test’ assessment made public in March – ignoring the monstrous derivatives ticking time bomb weighing them all down along with the entire financial system. WaPo editors endorse too-big-to-fail banks. They tout so-called “economies of scale and greater ‘soft power’ for US foreign policy. Near the end of his tenure, Bill Clinton signed legislation repealing Glass-Steagall (the 1999 Gramm-Leach-Bliley Act – letting insurance, investment and commercial banking merge) and the Commodity Futures Modernization Act (permitting unregulated commodity and derivatives trading). A casino culture of anything goes persists. When counter-parties don’t have funds to pay on demand, bubbles begin deflating. It’s just a matter of time before current market mania ends.